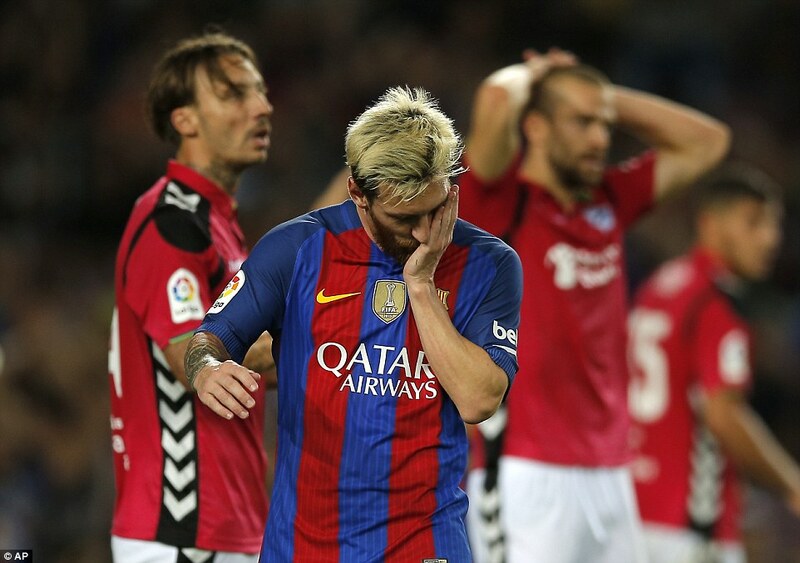 Barcelona played their expensive reserves against newly promoted Alaves and were dealt an embarrassing home defeat in the biggest shock of the season so far. Last season’s second division champions beat the title holders 2-1 with Neymar’s newly-dyed bleached blond hair the brightest thing about Luis Enrique’s side. He had left Luis Suarez, Lionel Messi, Jordi Alba and Andrés Iniesta on the bench and Gerard Pique and Sergio Roberto in the stands. Barcelona have invested in strength in depth this summer and surely this was the time to make use of it. But in a shocking first 45 minutes of misplaced passes, misunderstandings and wayward finishing Alaves were able to get their noses in front by taking one of only two chances that came their way. Barcelona came back in the second half but conceded again and now trail Real Madrid by three points after just three games played. There was big applause from the Nou Camp for debutant keeper Jasper Cillenssen as he got down well to make his first save for the club from Ibai Gomez’ long shot and like all Barça keepers he was largely a spectator early on, but what he was watching was not particularly impressive. Barcelona had another debutant in attack but Paco Alcacer – signed from Valencia for 30m in the summer struggled to get on the ball. Barça’s front three played as individuals and not together as Messi, Suarez and Neymar do so effectively. Neymar was back after his 100-day working holiday in Brazil winning Olympic gold. He had not come back to the same team he left behind. Arda Turan did shoot just over with an angled shot and right back Aleix Vidal had a powerful drive deflected for a corner. But Barça reached the half-hour still having not established a lead or shown any of their usual home form. When Sergi Busquets got his head to a Neymar free-kick the ball ended up as close to the corner flag as to the goal and that summed the team’s performance up. Another Neymar corner brought danger. This time he rolled it to Vidal whose powerful shot was deflected for a corner. From a third free-kick Neymar went for goal himself but bent the ball horriby wide. Alaves opening goal came from Deyverson Silva on 38 minutes. The visitor’s had a throw-in higher up the pitch than they had been for most of the first half and they caught Barça napping. Kiko Femenino spent two underwhelming years in Barça’s B-team from 2011 to 2013. But he left Denis Suarez flailing with some quick feet. And when he crossed for Deyverson the Brazilian got to the centre before Mascherano and steered his first time shot past Cillenssen. Rakitic shot just wide from inside the area with a minute left of the first half. A cushioned header from Alacer to Turan had created the chance – it was the first meaningful contribution for him in a poor first half for one and all. A different team emerged for the second half and within a minute Barcelona were on level terms. Neymar whipped in a corner from the right and Jeremy Mathieu rose to head the equalizer past Fernando Pachecho. It should have been two via the same route moments later but this time from another Neymar corner Mathieu this time hammered the ball wide. Alaves were not to be brushed aside so easily though. Edgar Mendez swept in a free-kick from close range but – with Messi stood alongside him, now warming up – the linesman raised his flag to rule the goal out. Replays showed he had called it right but it had been the tightest of decisions and Alaves were not to be denied their second goal. Gomez got it showing more determination than Vidal and Mascherano, the former capping a poor performance with some weak defending, and the latter struggling, having played two games for Argentina during the international break. It was a mystery why he had played the game while others with less air-miles in their legs had not played. The goal came after Iniesta’s introduction. Messi was already on and now Luis Suarez was stripped and ready to make his entrance. This had not been the plan at all. This was supposed to be the first-teamers taking a break while the reserves staked their claim and secured the three points. But Alaves held on comfortably. Barcelona were so desperate for the late equalizer they tried to play on around a pitch invader when he ran on in injury time and made a beeline for Sergi Busquets. Messi got the last chance of the game but shot just wide. It would have been harsh on the underdogs had it crept in at the back post. Alaves deserved their win. Previous articleHarry Redknapp: Gareth Bale has potential to knock Cristiano Ronaldo and Lionel Messi off their perch.